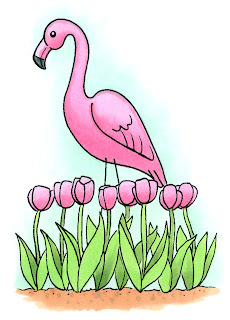 The other day my husband was joking about putting out a pink flamingo among our bulbs that are starting to sprout. 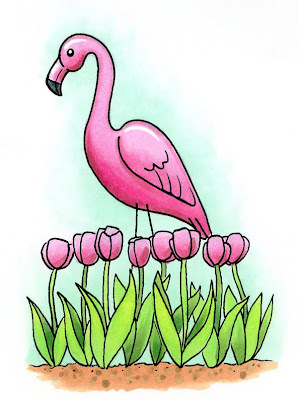 While I didn't want one in my yard, it got me to thinking about drawing one, so today I am giving you your very own free digi pink flamingo, and some tips about coloring it. This image has a beautiful row of tulips, and a lot of blue sky visible between the flowers. 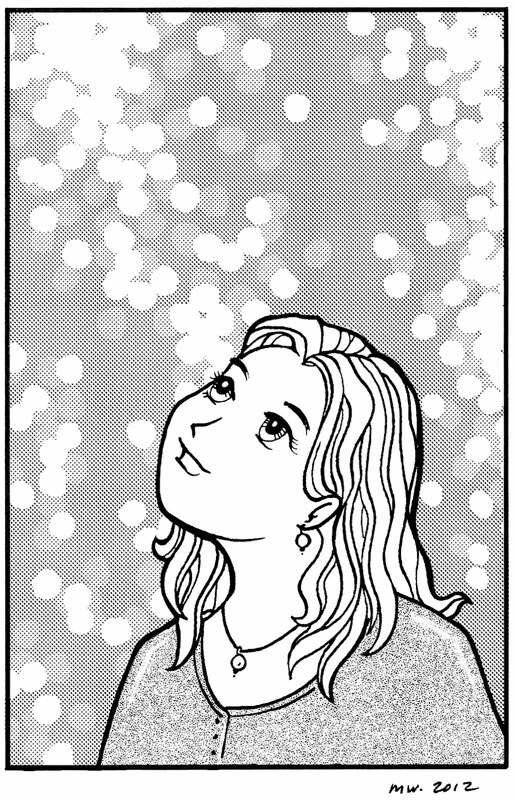 However, many of you who know me know that I am impatient and always looking for a faster/easier way of coloring. I wanted the sky to fade behind the flowers, but I didn't want to take the time to be picky about coloring the sky perfectly. 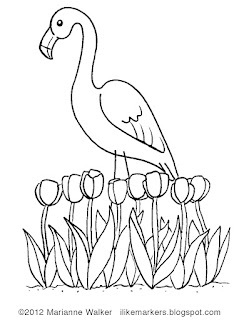 Many of you, in coloring this image, might start by coloring the leaves with YG05, as shown in A. However, that would be tedious once I went in and tried to blend out my pale blue sky. 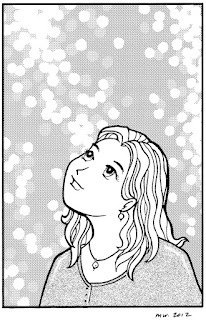 So, I started by coloring the sky, as shown in figure B. I colored with my BG10 and blended it all pretty with my colorless blender, without worrying about the leaves, since there is blue in green. 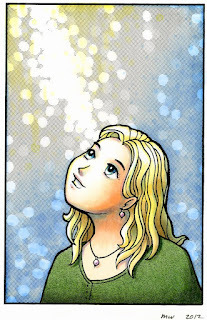 The BG10 is so pale I knew that it wouldn't really affect the bright green that will go over it. See how much quicker coloring is, once I didn't worry about the leaves? 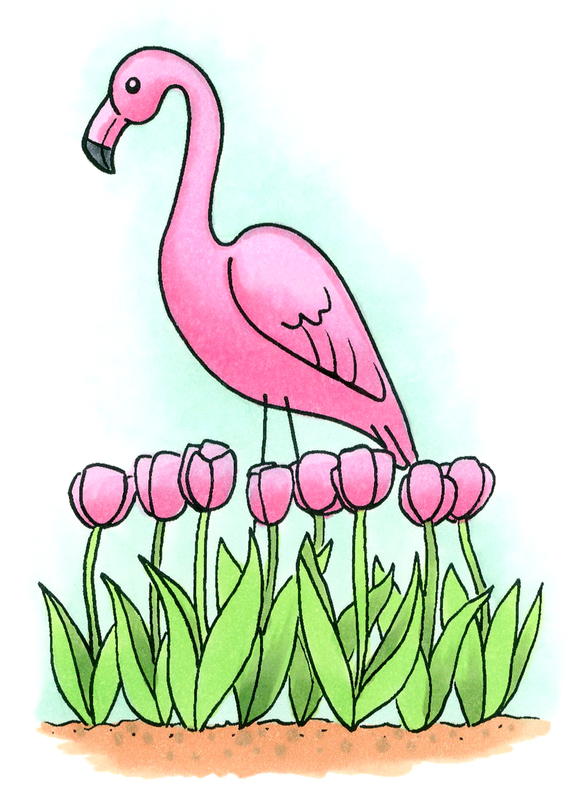 I tried to keep the bulb tops white, as those will be pink and the BG10 would not make the pink look as pretty. Next, I colored my basic flat colors. 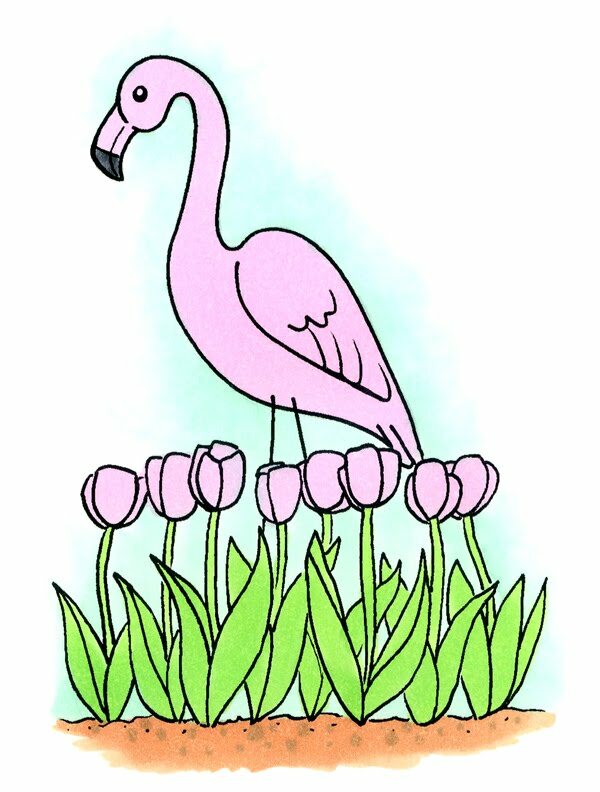 I started with RV52 for my base pinks, YG05 for the leaves, N7 for the black beak, and E13 with E44 spotted on for the ground. Then, I went back and added my first level of blending. What a difference it makes! I added RV55 to all the light pink areas. Then, I added YG63 to the vibrant green. For my final layer of contrast, I added RV66 to the pinks, and a hint of Opaque white to the highlights on the plastic flamingo. I darkened the contrast on the leaves with G46. I also dotted in a few more spots of color into the ground with YG61 and some more E44. 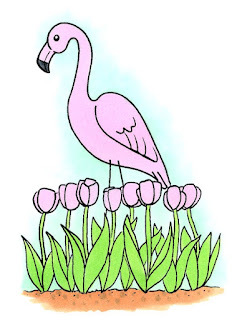 Overall, a very simple image, and coloring was really quick (scanning and writing the tutorial took a lot longer than coloring the image!) 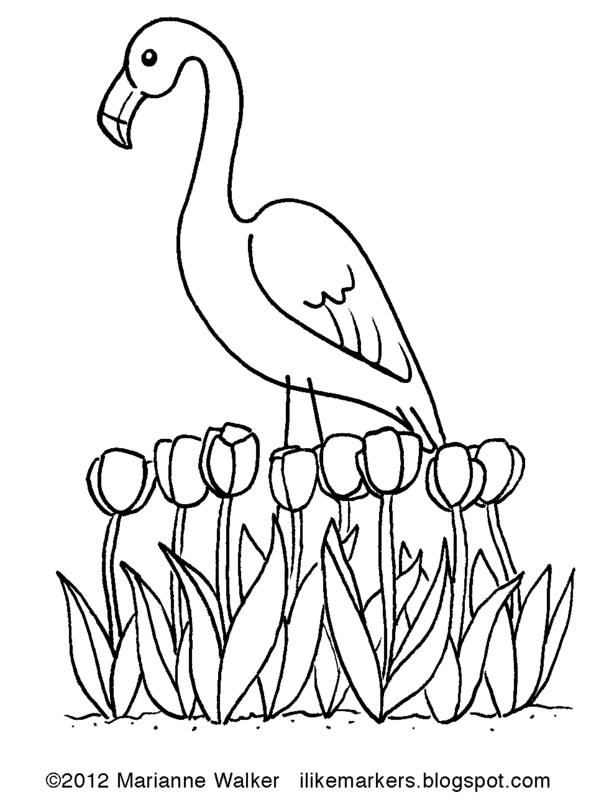 I hope you have as fun and easy a time coloring it as I did. On Thursday I have a great announcement, so stay tuned! Wow! Just about all of our classes are full or almost full. We still have a couple spots left this weekend for our Miami class, and two new classes opened today, but otherwise, our classes are SOLD OUT! Remember: I will be teaching the Phoenix Intermediate class coming up next month, and Sherrie will be teaching the Columbus OH classes. April 13th, Seattle, WA taught by Lori Craig filling fast!! April 19th, Milwaukee, WI taught by Debbie Olson filling fast!! March 10, Columbus, OH taught by Sherrie Siemens only 2 spots left! April 14th, Seattle, WA taught by Sherrie Siemens filling fast!! April 20th, Milwaukee, WI taught by Debbie Olson filling fast!! Today I wanted to finish up the tutorial on using screen tones. Yesterday we talked about using screen tones with a black & white illustration, today I wanted to discuss colored artwork. Coloring screen tones can be kind of tricky. 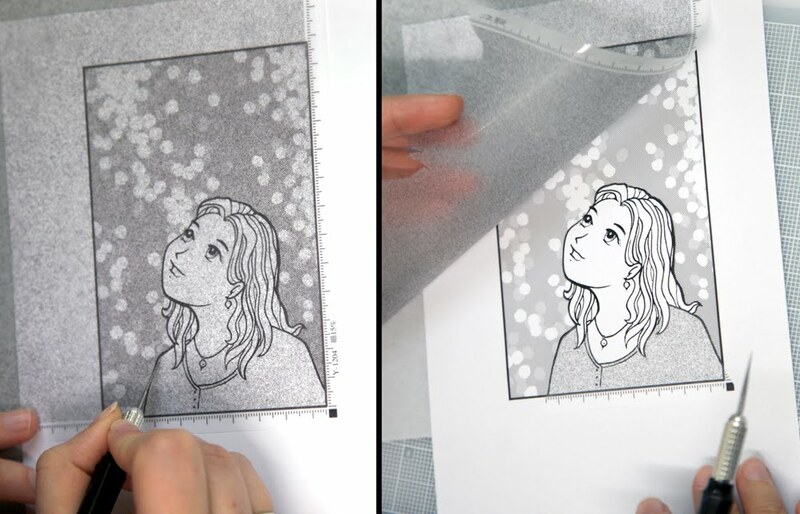 The problem is, that screen tones are non-porous, and if you try to color over them with Copic markers, it will not work very well. 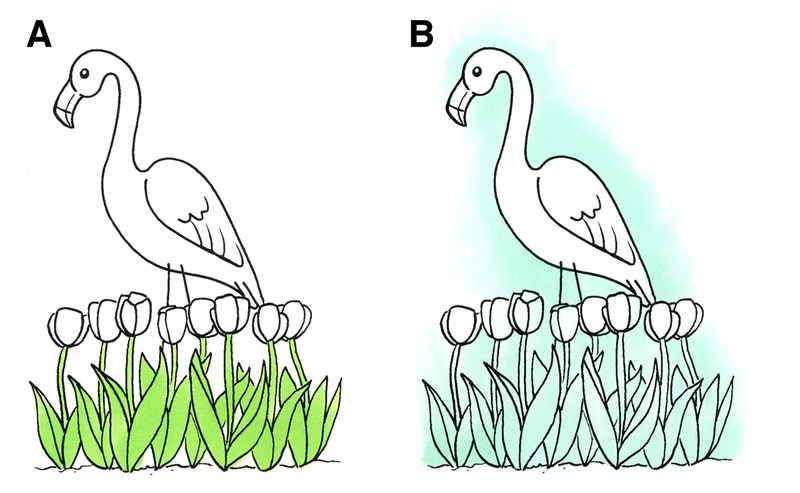 Here are two options to allow you to color your work. Color your image with markers before you apply any tone. 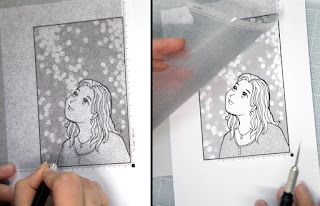 As you can see from the first image, the girl doesn't look too bad, but I want more texture to her shirt, and I want the sky to have that same pattern from yesterday. 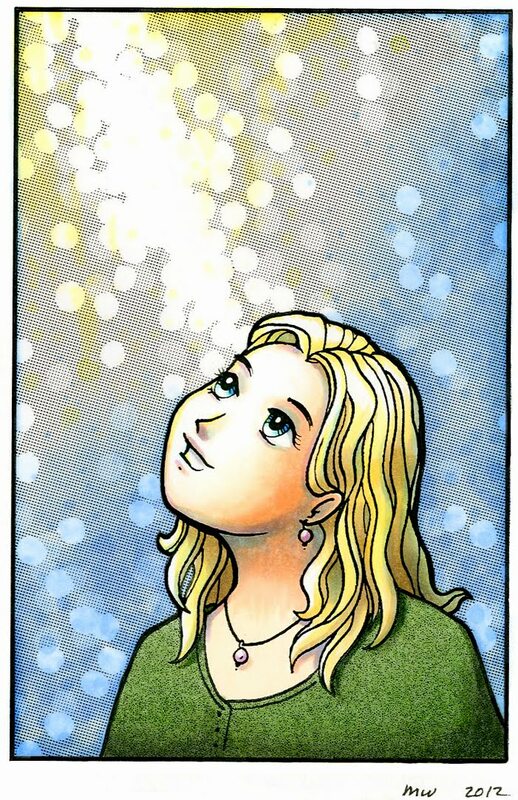 I colored it, planning where tones would be, and having my textures mimic the tones I will be applying (dots in the sky pattern). Once ALL my coloring is done, then I can apply tones like I did on yesterday's post. Be sure to burnish your tones well, or else the colors will not appear as nicely through the tone areas. Cutting note: If you are going to be cutting along straight lines, cut against a metal ruler or metal-edged wooden ruler. Your craft knife may get caught on the edge of a wooden or plastic ruler and nick or damage the edge. When cutting with a metal ruler, be careful to keep the sharp edge of your blade from scraping against the metal. This might damage the blade. Try not to push too hard on the ruler when cutting, as it may stick the tone down where you don't want it to go. 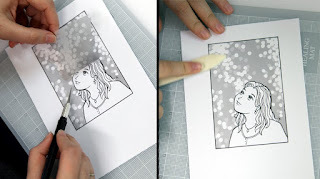 Soft Paper warning: If you have a very soft or fibrous paper, when you try to pull up the extra tone it may pull up some of your surrounding colored areas. This might be more pronounced if you are coloring with colored pencils and especially chalks. This is not as big a problem with marker, which permeates the paper better. 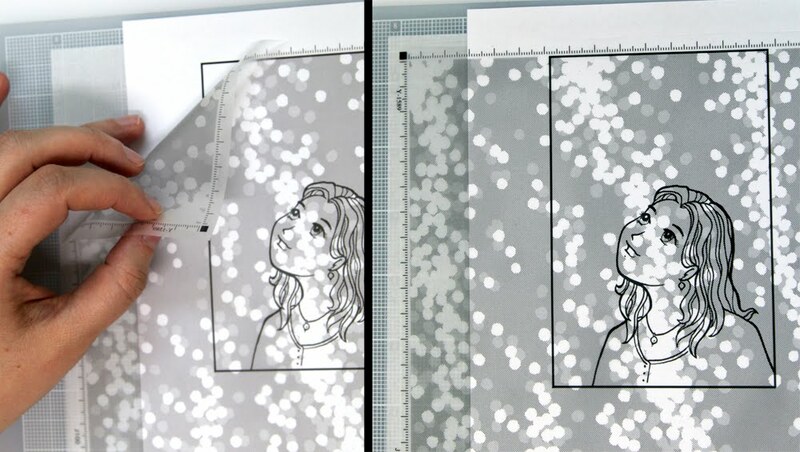 I always prefer coloring a photocopy, otherwise there is no way to undo a mistake if there is a problem with the coloring. 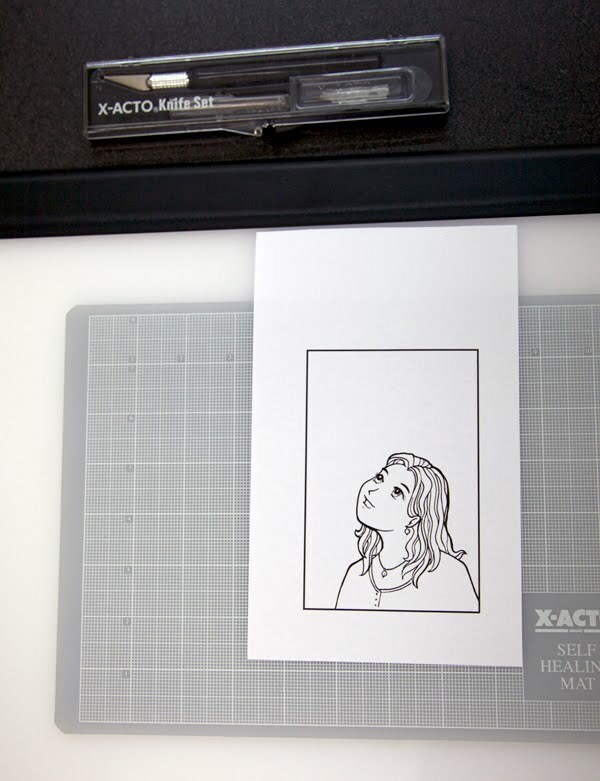 You may have to adjust your photocopier contrast to get the best printout when you copy your line work. Make sure the contrast is high, so you don't lose any line darkness on areas where you may not have burnished the tones enough. If it copies too dark, then lower your contrast or increase your brightness. 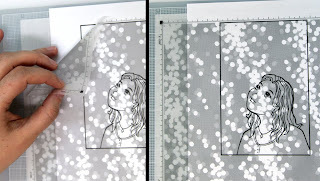 If you are going to be shrinking your final piece: whenever possible, color the full scale version, then shrink later. 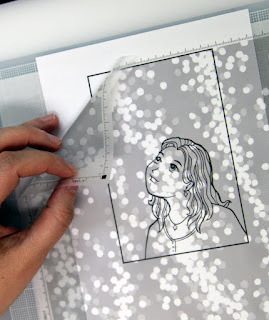 This helps you have the most detail and it is much easier to accurately color tiny areas if they are slightly larger. After months of work, and then months of waiting, it is finally here! 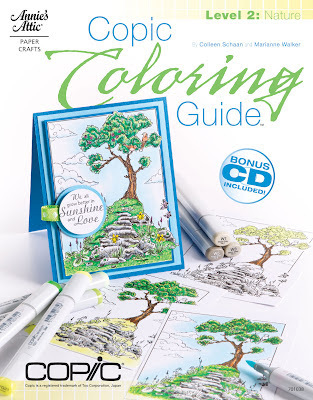 Colleen Schaan and I have just released our second book in the Copic Coloring Guide series. You can pick up your very own copy direct from Annie's Attic, or from your local retailer. 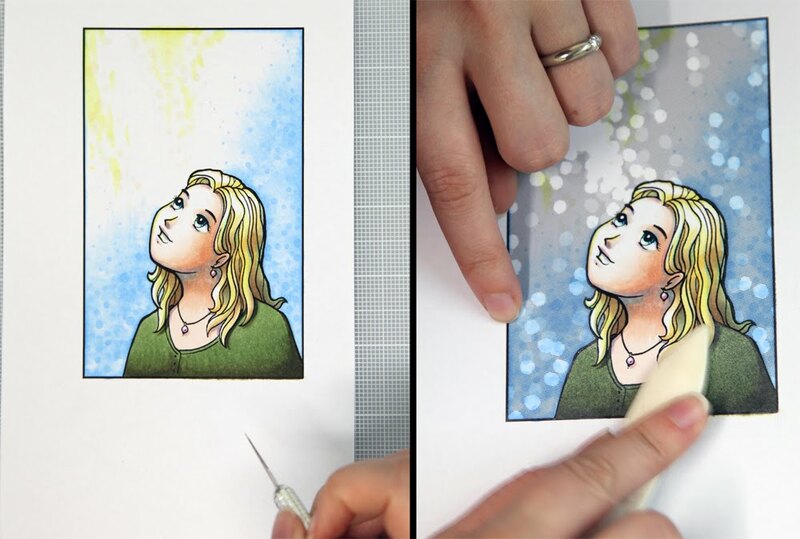 The Copic Coloring Guide, Level 2 teaches you how to color things in nature, from rocks and plants, to water and sky. 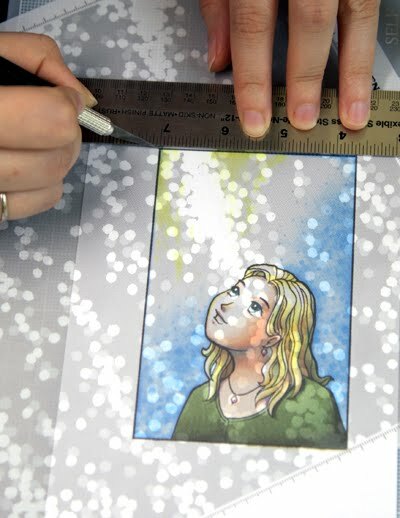 Best of all, each image we step out in a tutorial is included on a CD that comes with the book, so you can print the image and practice along. Colleen and I worked hard to make sure directions are clear and simple. I carefully drew each tutorial image to teach the coloring concepts as concisely as possible. This book is a perfect companion for the bestselling first book, and will look great in your growing Copic library. I will have more fun details about the book in a few weeks, and each of the contributing designers will be sharing some neat things from the book. Meanwhile, go ahead a pick up a copy or ask your local store when they will be getting it in stock. Enjoy coloring! 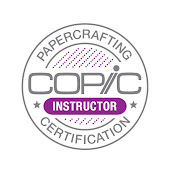 Before I post my weekly tutorial, I need to update the Papercrafting Certification classes, as there have been a few minor changes, and new classes have opened, and many classes have filled. A few small changes: I will be teaching the Phoenix Intermediate class coming up next month, and Sherrie will be teaching the Columbus OH classes. March 2, Edmonton, Alberta, taught by Sherrie Siemens almost full!! March 8, St. Louis taught by Lori Craig almost full!! March 9, Columbus, OH taught by Sherrie Siemens almost full!! March 23, Phoenix, AZ taught by Lori Craig almost full!! As promised, here is a brief post about my process for working on the artwork for the Oregon Asian Celebration. 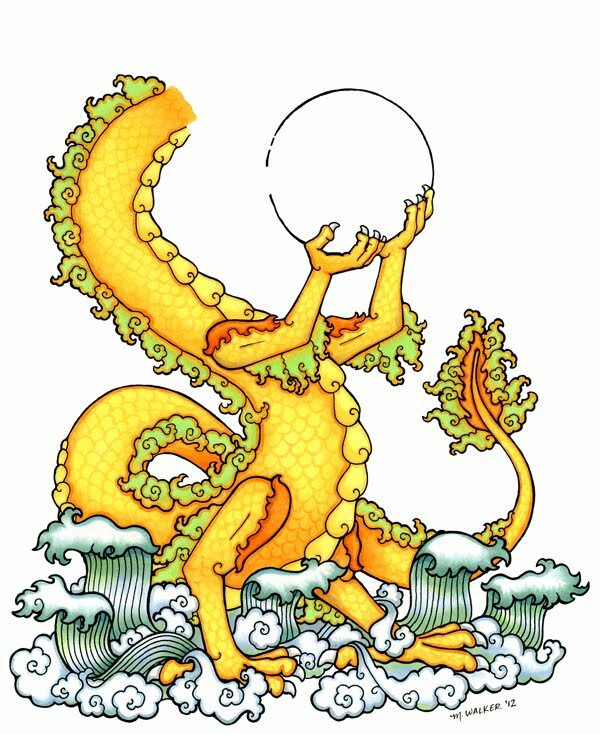 This year's dragon went back and forth many times before we decided on a final version. Once a final was chosen, then I could start coloring. 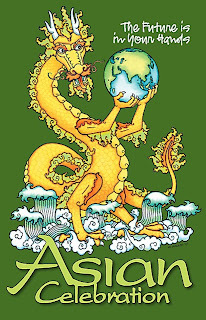 For more information about the Oregon Asian Celebration, please visit their website. I actually colored the image parts separately, then combined them on the computer. I didn't write down all the colors I used, so I am going from memory on my colors. I started by coloring the head. As I had not exactly decided how I was going to position the head, I did not draw in his eyes until after I had attached the head to the final artwork. I worked in tones of YG11, YR12, YR15, YR04, and YR21, with shadows of YR18 and YR27. The blue/gray is B52 and BG72 with hints of C3 and BV31. The scanner did not pick up all the subtleties. However, I like how rich and vibrant the golds and yellows came out. In testing colors I liked the combination of the vibrant orange with the lime-green color on his fringe. 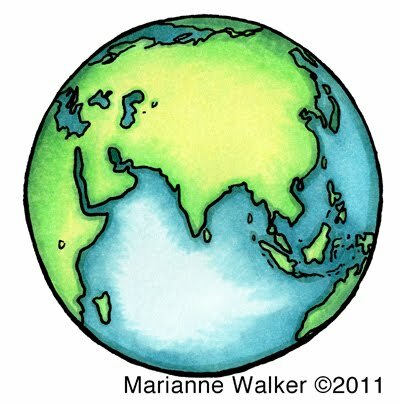 Next, I colored the globe. This was much easier. I love how the colors came out in this image. I worked heavily with the BG70's family and the green areas were colored with G20, YG11, and BG72. I really like how the globe came out by itself. 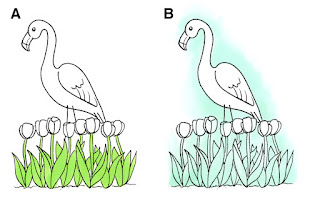 I can think of lots of nice uses for this portion of the illustration. 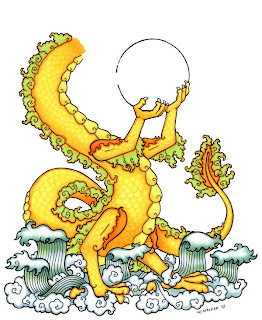 Last, I worked on the main dragon image. You can see from this version how strange it looks without a head or the globe finished. 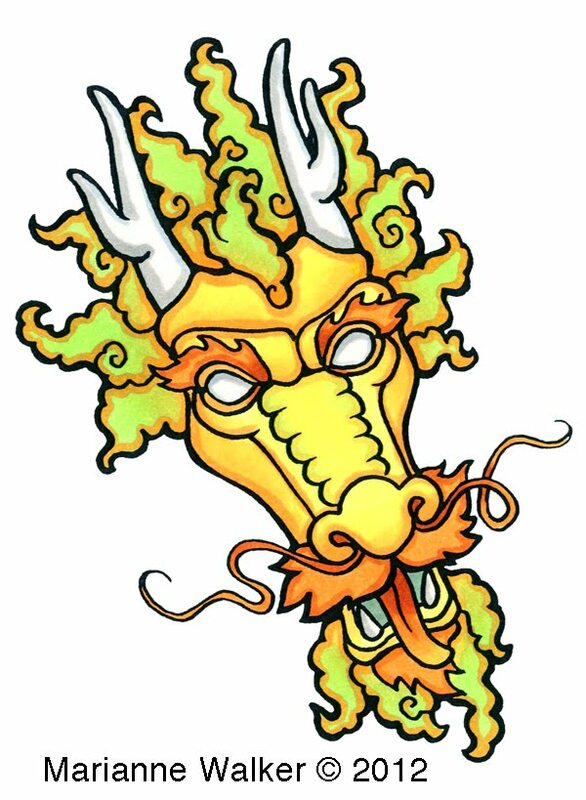 I used the same colors from the dragon's head, then I used B52, YG11, BG72, and many of teh B90's markers for the waves. Again, I accented with BV31 for the grayer areas. After all the base coloring was done, I carefully drew in the scales with the brush tip of my YR12 and YR14 markers. Then, I held it at arms length and decided which areas needed darkening. I went back with my deep oranges and hints of gray to add shadows. The final image was tweaked slightly in photoshop for the poster, as the waves scanned in too gray. Otherwise, the poster is fairly accurate to the original scan. 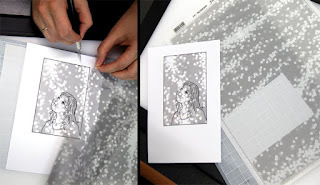 I will be demoing part of the time at the Youth Art Room at the Oregon Asian Celebration. 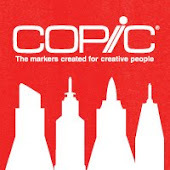 If I am not at our table, then many other fabulous people from Copic will be demoing. I hope to see you there next week! I've been pretty busy since coming home from CHA, but I wanted to post a quick update for some great local events. This Saturday, Feb. 11th, from 2 to 4 I will be in Eugene at the U of O Bookstore hosting a free workshop on marker rendering. Seating can be limited, so be sure to arrive on time. 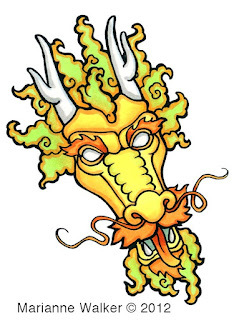 Feb. 18-19th, come celebrate the Year of the Dragon! 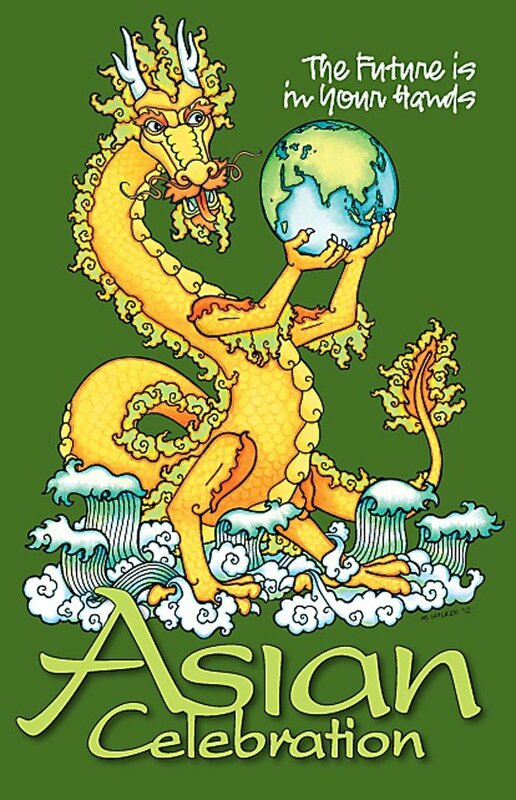 Oregon Asian Celebration, Lane County Fairgrounds. 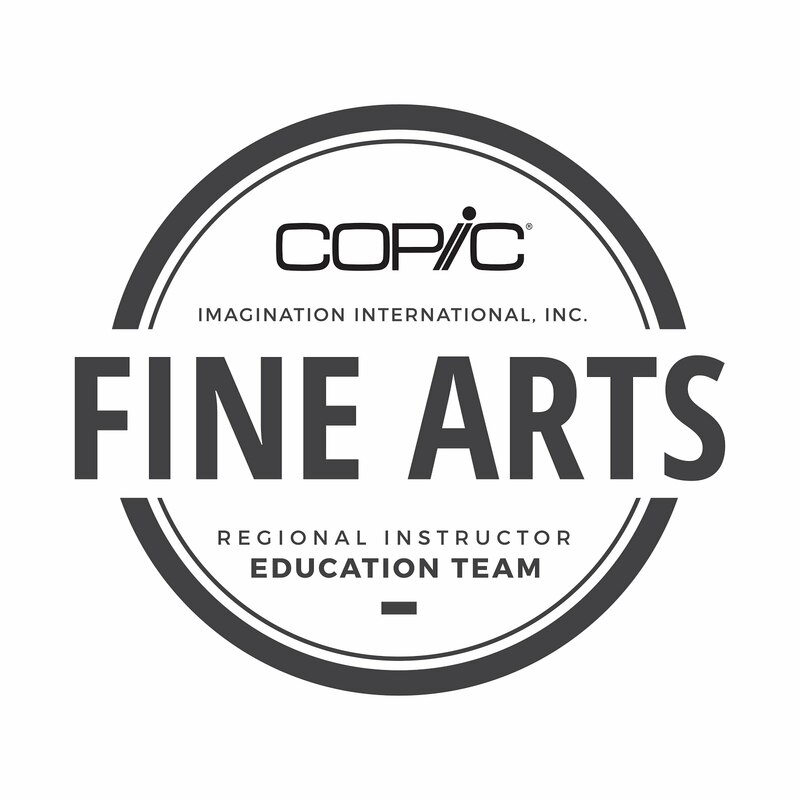 Copic/Imagination International will be sponsoring coloring tables in the Youth Art room. 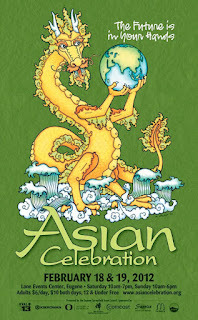 You can find out more from the Asian Celebration Website or from their Facebook page. Once again, I designed the artwork for this year's Asian Celebration poster. The image was colored entirely with Copics. Later this week I will try to post more information about my design process for that image.